A challenging overseas trek is being organised by a local hospice. 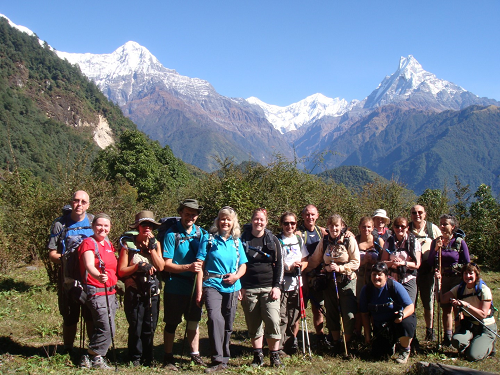 For the first time, St Richard’s Hospice – based in Worcester – is organising a bespoke 12 day challenging trek to the Himalayas, exploring the Nepalese countryside. The trek will take place from 2 to 13 November 2019 and on Wednesday 5 September, the hospice – along with travel organiser Different Travel – will be holding an information evening at its Wildwood Drive site. Representatives from the travel company will be on hand to inspire potential travellers and answer any questions. Walkers are urged to sign up by the end of September to allow time for training and fundraising. Importantly, the trip will also include two days helping a non-profit hospice care organisation in Kathmandu which – like St Richard’s – offers services and support to terminally ill patients and their families. Raise a minimum of £3,600 in sponsorship and the trip will be funded by the hospice. Hospice supporters have previously taken part in a variety of overseas challenges to raise funds towards the charity’s care. Last year, paramedic Rebecca England from Worcester took part in a trek to the Great Wall of China to raise funds for the hospice which cared for her mum. Raising almost £3,200, Rebecca said the experience was a once in a lifetime one. She said : “I really enjoyed my time in China waking the Great Wall. At first I was a little bit apprehensive as I had decided to take on the challenge by myself but once I met the rest of the group I was put at ease. Everyone in the group was lovely and meeting them was one of the highlights along with walking the Great Wall and seeing the amazing scenery. The guide, who was organised through Charity Trek and Travel was extremely good and everything was really well organised. Staying in the guesthouses along the way was also a great experience as you were able to see how the people in the more rural parts of China lived. “To prepare for the trek I made sure that I did lots of walks along the Malvern Hills. I made sure that I would be able to walk for long periods of time and that I was ok with walking up and down steps, as there were a lot! “I think that Mum would have been really proud of me undertaking the challenge. She was always very encouraging and would have supported me one hundred percent. To confirm attendance at the September open evening please contact fundraising@strichards.org.uk or call the Fundraising team on 01905 763963. For further information, please visit https://www.strichards.org.uk/event/nepal-trek-2019/. St Richard’s Hospice provides free specialist palliative and end of life care for patients living with life-limiting illnesses and supports their loved ones. Each year the hospice team supports more than 3,300 patients, family members and bereaved people in Worcestershire. St Richard’s has launched the Build 2020 Appeal which aims to raise the final £1.4m needed to build a bigger hospice, enabling more patients and families to be cared for in Worcestershire. The total cost for expanding and redeveloping the existing building in Wildwood Drive, Worcester, is £5.3m. Send your ‘Ready to Publish’ press releases to aaron@worcestershirehour.co.uk along with a high resolution photograph or image file. We will publish on the day of receipt (Mon-Fri if before 3pm) and tweet a link to our 20,000 mainly local twitter followers.